Notice that I bolded “It’s non-intimidating.” That’s exactly what I’ve felt about looper. I got a simple BOSS LoopStation awhile back, which is a really nice looper, and one of the more simple loopers on the market. But even being relatively simple, it still came with a pretty thick users manual! I have a busy life, and I use most of my spare time to gig or record. I don’t have a lot of time to read a manual, and with the thick manual, I was admittedly a little intimidated. After I read the press release, my first reaction was, “Holy S%&t! That is something that I can use NOW!” One knob? Check. One button? Check. Made just for guitar? PERFECT! I’ve been wanting to do some looping during my solo gigs, so I could add some instrumental guitar. I tried using the LoopStation for awhile, but I could never get the hang of it because I used a footswitch along with the pedal, and kept on forgetting which one activated which feature. But there’s no guesswork with a single button. Yup, I’m definitely going to check this one out! At $165 US there’s no way I would buy one of these. I’ll hope at NAMM the have a realistic price, I guess I’ll see. Wow – thanks for the head’s up on this one Dawg! That looks like just what the doctor ordered, and it’s about the size of an EP-Booster! Nice!!! Yeah, this is exactly what I was looking for in a looper. 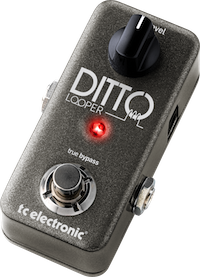 Since I play solo, and will only use a looper occasionally, having a simple one with a small form-factor is perfect for my needs. My Boss Delay has basically the same function, but I can’t use delay and loop at the same time. Interesting pedal, a good street price might make it more tempting.